41. 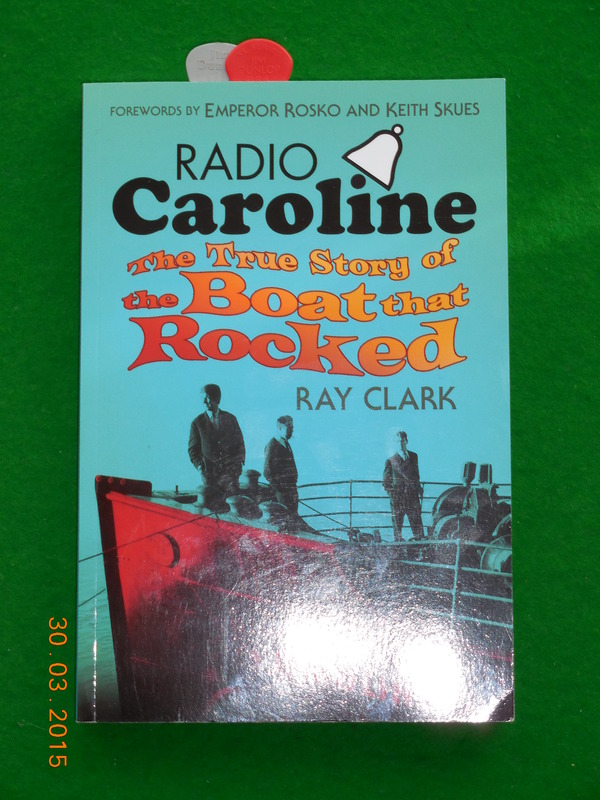 “RADIO CAROLINE: THE TRUE STORY OF THE BOAT THAT ROCKED” by Ray Clark. Plus, a personal voyage down the piratical sea-lanes of my memory! I’ve just finished reading the book Radio Caroline: The True Story Of The Boat That Rocked (History Press, 2014) by Ray Clark. My copy is the paperback version, with 256 pages; and it is a bit larger than a standard-sized paperback. There is a Foreword by EMPEROR ROSKO and KEITH SKUES. It tells the history of the pirate station in great detail, from its inception in 1964; to its current on-line format. It details the planning; the ships; the equipment; the legal and financial wrangles; as well as the less savoury shenanigans that went on – the plots, the back-stabbing, and even a murder! And there are some fantastic photographs throughout; including a magnificent colour section in the middle. This is a very good book indeed; and I really enjoyed reading it. I’d recommend it to anyone who has an interest in pirate radio; in broadcasting in general; or in the history of British pop music. At all times it is easy to read and interesting. It is extraordinarily well researched. The author is to be congratulated on a fine piece of writing. My only complaints about this book are: (1) That I think an appendix containing a definitive list of all the Caroline DJs who ever broadcast, and their dates of service would have been very useful. (2) That some sample play-lists from the various periods of the station’s history could have been shown to illustrate the varied and changing styles of music played – there were so many DJs that I’d bet some of them kept some play-lists as mementos, and would have been only too pleased to lend them to the author. There is one play-list shown but it is from a Radio Atlanta programme from the early 60s. And finally (3) one or two maps showing the positions of the various transmitter ships that Caroline used could have been included; showing broadcasting positions, wreck sites and the three-mile limit. Personally, my first memory of the pirate radio station is from c.1967. It seems ridiculous now, but as a family, we’d often go on holiday to Felixstowe in Suffolk – only an hour’s drive from where we lived at the time; but it seemed like another world to we kids then! I remember my Dad saying that there was a pirate ship just off the coast and if they came ashore they’d be arrested. As a seven year-old I didn’t have a clue what pirate radio was; but I knew what pirates were! So I imagined the Old Bill fighting it out with a lot of cutlass-wielding thugs in tri-corn hats! Sadly that was a spectacle that I was never to see! I particularly liked listening to the personal Top 30’s that the listeners sent in to the Caroline HQ based in Spain. Two of these were broadcast each Friday, Saturday and Sunday evenings between (I think) 6pm and Midnight. Many of these Personal Top 30’s would culminate in Led Zep’s ‘Stairway…’ which I never seemed to tire of; and was always surprised if it didn’t reach their respective No.1 spots! 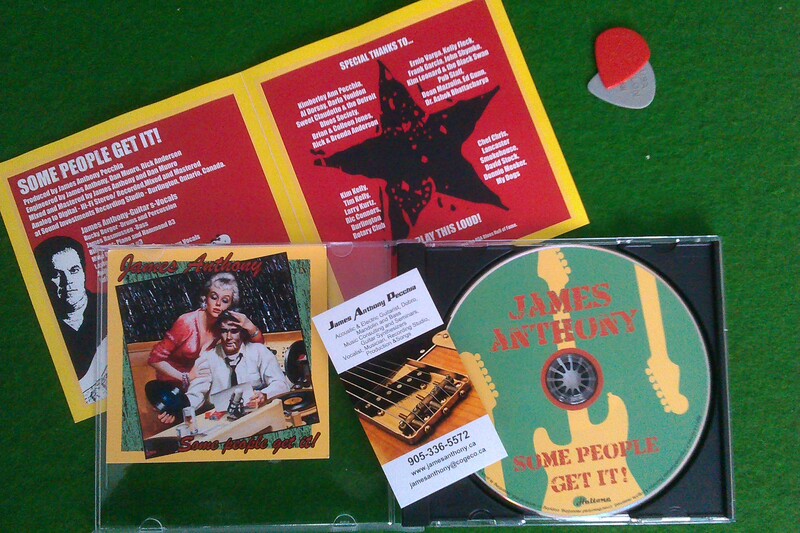 Other very commonly played tracks I remember, were BJH’s ‘Mocking Bird’ and LONE STAR’s ‘Bells Of Berlin’. I recall scribbling out my own Top 30 with a view to sending it off; but never got round to it because I couldn’t decide the best 30 from hundreds of new songs I’d heard in the previous few years. I think RUSH’s ‘Xanadu’ was my No.1 from early ’78 though; with maybe STRIFE’s ‘Sky’ at No.2. When I first started listening to Caroline; both it, and Dutch language Radio Mi Amigo, were both broadcasting from the ship MV Mi Amigo simultaneously. But then they merged due to financial woes and began to share the same wavelength – R.Caroline by night; and Mi Amigo by day. 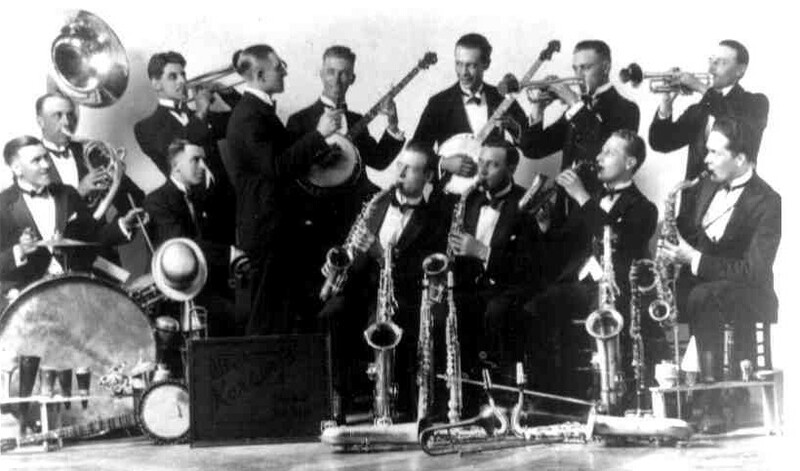 Even though I couldn’t speak Dutch, it was still worth listening to during the daylight hours, as they played similar sounds that I could relate to. In order to publicise themselves and make a little dough, there were also the Radio Caroline Road-shows. These took the form of a rock disco. I remember attending several of these from about ’77 to ’80 in various locations across London and Essex (one in Southend-On-Sea, I recall – and more on this later). These were normally hosted by two or three of the well-known Caroline DJs who’d play everyone’s favourite up-beat rock songs; and sometimes a band would agree to play too. They’d normally finish with Led Zep’s ‘Stairway…’ or Skynyrd’s ‘Freebird’. I particularly recall one Road-show held upstairs at The Red Lion PH in Leytonstone, East London. This was hosted by three DJs – I think they were: Rob Eden; Robbie Day and ‘Harvey The Rabbit’ (now I need that appendix of DJs to be sure!) I remember the sprung wooden floor in this pub started bouncing alarmingly due to all the dancing about! And I can date this gig quite precisely because I remember one of the DJs playing a track from the latest BLACKMORE’S RAINBOW album, Long Live Rock And Roll, which had just been released; and he asked if anyone had it yet. I was one of only a few who’d got my hands on it at the time; and I know it went on sale in April ’78. I also remember my mate Mark (whatever happened to him, I wonder?) impressing some girls with a great impersonation of Leonard Rossiter’s character ‘Rigsby’ from the 70s TV sit-com Rising Damp – and it paid off for us too! Nice one Mark! Then in 1980, the rusting Mi Amigo sank in shallow waters in the English Channel; taking Radio Caroline with her, and leaving only her mast above the waves. A campaign was started to raise money to re-float her – or buy a new ship. Part of this campaign was a new road-show. I went to one of these new series of gigs at Ilford Palais, in late April 1980. I seem to remember that the NWOBHM band, TYGERS OF PAN TANG were on the bill. They and some other bands had agreed to help get Caroline on-air again, and I heard they were playing for free. Incidentally, whilst I was there, I bumped into Paul Di’anno – original singer of Iron Maiden; who I knew from The Ruskin Arms, East Ham – and we talked about their debut album Iron Maiden which had just been released. I think the biggest name that Caroline had on board for this fund-raising tour, was GILLAN. They too had agreed to help out and were booked for a show somewhere. I remember this because I bought a Radio Caroline sweat-shirt at the Ilford gig, with all the other dates printed on the back of it; but I never saw Gillan at that particular road-show unfortunately. Then, when they finally got their new ship fitted out and started transmissions once again in ’83, I eagerly tuned in; but they seemed to be playing stuff that I really didn’t want to listen to, so I gave it up for yonks and never gave it another thought. Circumstances in my life changed my priorities at around that time too, and I found less time to go to gigs or listen to the radio anyway. From reading the book though, I realised that there was a show on the new Caroline that would have suited me – Caroline Overdrive. But, sorry to say, that passed me by! Here is a link to Caroline’s website….. Here is an excellent compilation of Radio Caroline jingles….. This entry was posted in Book review, Gig review, music blah blah, reminiscences and tagged bjh, blackmore's rainbow, emperor rosko, gillan, history press, ilford palais, iron maiden, keith skues, lone star, mi amigo, moody blues, NWOBHM, paul di'anno, phil the music quill, radio atlanta, radio caroline, radio nordsee international, ray clark, red lion leytonstone, rush, strife, tygers of pan tang on March 30, 2015 by PTMQ. 19. RUSH: “A Farewell To Kings”; and memories of 1977! Apparently, it was 37 years ago this September that Canadian prog-rock supremos RUSH, released what many (myself included) consider to be their finest album: the epic ‘A FAREWELL TO KINGS’. Reading this recently on Face Book, I stepped back in time to 1977; and my first encounter with this classic work. Here’s the story…. Those readers old enough to remember the 70s will know that it was a fantastic era for rock music of all types. But apart from word-of-mouth, in those pre-internet days, there were precious little ways to hear about, or find out about new music. The chief source of information was BBC 2’s ‘THE OLD GREY WHISTLE TEST’, hosted by ‘Whispering Bob’ Harris; who we teenage rockers considered to be the most musically knowledgeable bloke on Earth! Now, the OGWT was aired late on a Tuesday night, and never repeated; and there were no means to record it back then; so if you missed it, you missed it for ever! This wasn’t a problem if you were home on a Tuesday evening, of course. The problem was that three stops down the line from where I lived was a pub called ‘The Green Gate’ (now, sadly, a McDonalds!) which held a ‘Heavy Rock Night’ (you’ve guessed it! ), every Tuesday evening! This was an event that I rarely missed for years, in spite of the necessary evil of missing the OGWT and all the exposure to new sounds that it proffered. So, one Tuesday evening in late ’77, there I was at ‘The Green Gate’ watching the regular house band (who I think were called Tonix) covering ‘Smoke On The Water’, ‘Whole Lotta Love’, or some such classic, when in walks the girl I was going out with at the time (who’s name I honestly don’t recall), and within a few minutes we were rowing about something or other. Well, whatever it was about, I got so annoyed with her that I buggered off home thinking ‘Well, at least I’ll catch the end of the Whistle Test’. And sure enough I did. I put the telly on, tuned it to BBC 2, and ‘Whispering Bob’ was just saying (in his inimitable way) something like ‘Here is Rush on stage in Toronto performing ‘Xanadu’ from their new album ‘A Farewell To Kings”. Who the hell are Rush?’ I thought. There they were – a band unknown to me at the time – a drummer almost invisible behind the biggest drum/percussion kit I’d ever seen; a guitarist playing weird, mysterious-sounding chords on a twin necked Gibson; and most remarkable of all, a bassist playing a twin necked Rickenbacker whilst singing AND playing keyboards! Well after a few seconds of ‘Xanadu’ I was a Rush fan! It was just what I wanted to hear at just the right time. I was sick of the New Wave/Punk Rock thing; and radio DJs and the music press telling us that the old ‘dinosaur’ Prog-Rock and heavy Rock bands were a thing of the past – even though venues like ‘The Green Gate’ were packed with punters every Tuesday, listening to classic rock, and eschewing the Punk/New Wave thing with a vengeance! The problem was that there was precious little new Prog or Heavy Rock being recorded because the record companies believed the out of touch DJs and music press; And then there was this Canadian band called Rush! 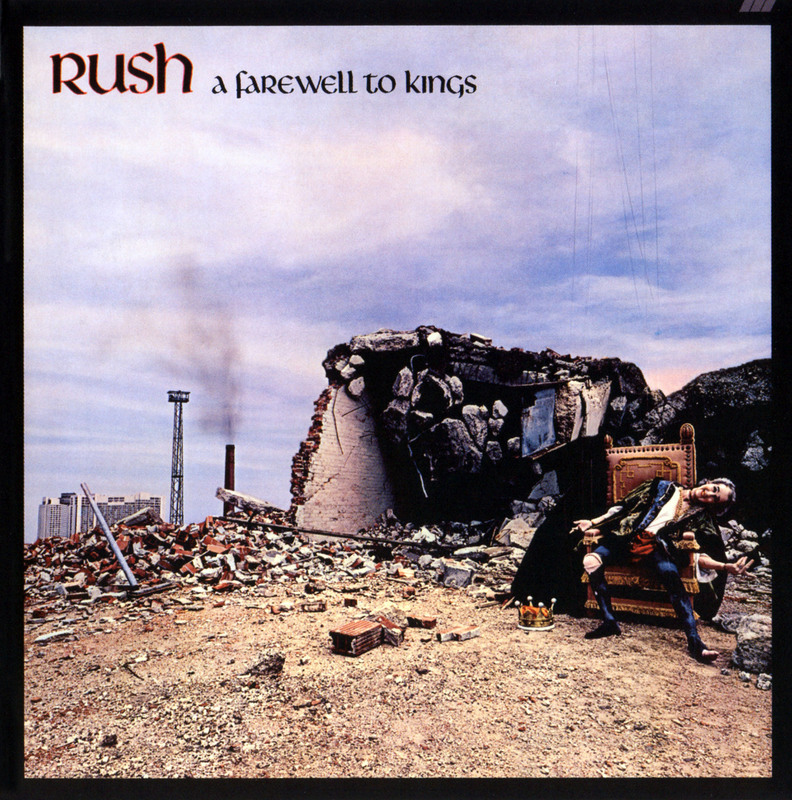 Rush’s albums had only been available as imports up until ‘A Farewell To Kings’ was released in Britain. A 12-inch EP was released by Mercury Records, showcasing 4 Rush songs: ‘Closer To The Heart’ from the new album; along with ‘Anthem’ from ‘Fly By Night’ (1974); ‘Bastille Day’ from ‘Caress Of Steel’ (1975); and ‘The Temples Of Syrinx’ from ‘2112’ (1976). Well I bought the 12-inch, and the new album; then over the next couple of weeks got my hands on the whole Rush back-catalogue which had all now been released in the UK. But I had to wait until May ’79 before I first saw the band live (at Hammersmith Odeon). That was a gig to remember! After all these years, ‘Xanadu’ by Rush remains my favourite Prog-Rock track (beating STRIFE’s ‘Sky’ into 2nd place; and MMEB’s ‘Blinded By The Light’ into 3rd). But most of the early Rush material is deeply ingrained in my mind – their work (especially ‘A Farewell To Kings’) is to a large extent, the soundtrack to my late-teens! My thanks to ‘Whispering Bob’ and a nameless ex-girlfriend for a sequence of events that introduced me to a band who have given me a great deal of pleasure for many years! PTMQ. This entry was posted in Album Review, reminiscences and tagged 70s music, a farewell to kings, old grey whistle test, phil the music quill, prog-rock, progressive rock, rush on September 2, 2014 by PTMQ.